A RemoteDepositCapture.com poll reveals that the limits banks and credit unions place on the size of consumer checks eligible for depositing via mobile RDC are rising steadily. 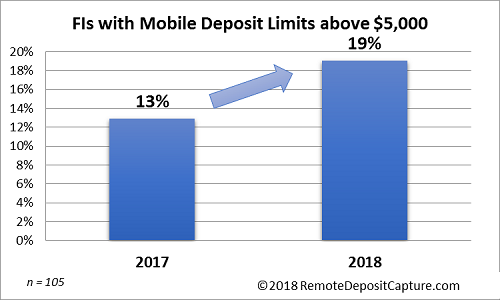 In fact, the past year has seen the number of financial institutions with standard per-item deposit limits above $5,000 for consumer mobile deposit customers growing by nearly 50%, according to the latest Poll Central tally by RemoteDepositCapture.com. Remote Deposit Capture tech is taking hold! It should be noted that the 2017 mRDC Industry Study, released last month by RemoteDepositCapture.com, revealed that issues like duplicate deposit losses are not a widespread problem. Among the financial institutions participating in the study survey, 74% reported no losses due to mRDC. It goes on to note that the duplicate loss rate was just 0.035%, or 3.5 for every 10,000 mRDC items, based on the study analysis. To compare: the Federal Reserve reports an overall return item rate of 0.4%, or about 40 out of every 10,000 checks deposited. Generally speaking the ebb and flow of payments fraud across various payment types and channels will continue to evolve. With greater limits comes greater risk. Controls like payment negotiability testing as well as check stock validation, automated signature verification and alteration prevention functionality — all of which OrboAnywhere Fraud offers — will help control losses and risk as limits grow!